The Democratic nomination process differs from the GOP process in that it has 712 wild cards with an outsized amount of power: the superdelegates. They're roughly 15 percent of the 4,763 delegates who will attend the Democratic National Convention in Philadelphia this summer to formally choose the nominee. And they're also a full third of the number of delegates needed to secure the nomination: 2,383. A superdelegate falls into one of three categories: a major elected official, including senators and members of the House of Representatives; a notable member of the party, such as a current or former president or vice president; and some members of the Democratic National Committee (DNC). Unlike the rest of the delegates -- who are pledged to certain candidates based on the outcomes of their state's primaries or caucuses -- superdelegates are unbound, meaning they can support any candidate they choose. They can also switch their support at any time, right up until the actual nomination at the convention. Who are some notable superdelegates this cycle? President Obama and Vice President Biden are superdelegates. So are former President Bill Clinton, his vice president, Al Gore, and former Vice President Walter Mondale. There's also former Sen. Chris Dodd, now the head of the Motion Picture Association of America and former DNC General Chair. Virginia Gov. Terry McAuliffe is because he's a former DNC chairman. As a member of the Senate, Bernie Sanders is a superdelegate even though he's technically an independent (he caucuses with the Democrats). Hillary Clinton was a superdelegate when she ran for president in 2008 because she was a member of the Senate, but she no longer is. How could they affect the 2016 election? Hillary Clinton holds a vast lead in superdelegates: 451 say they'll support her, compared to Sanders' paltry 19, according to the latest Associated Press delegate count. That's why Clinton was able to tie Sanders on delegates coming out of the New Hampshire primary even though he decimated her in the popular vote by 22 percentage points. Clinton entered New Hampshire's primary with an advantage: six of the state's eight superdelegates. Of the state's 24 delegates awarded by the primary vote, Sanders won 15, while Clinton won nine delegates, so overall, they tied. Sanders would have to win the remaining two superdelegates, who are still uncommitted, to come away with an advantage. He thinks that he'll be able to sway at least some of the superdelegates to come over to his camp, and started meeting with them immediately after the New Hampshire primary. "If we continue to do well around the country and if superdelegates -- whose main interest in life is to make sure that we do not have a Republican in the White House -- if they understand that I am the candidate, and I believe that I am who is best suited to defeat the Republican nominee, I think they will start coming over to us," he said on CBS' "Face the Nation" earlier this month. University of George political science professor Josh Putnam, an expert in the electoral process, told CBS News that it's still a little early to say just how much influence superdelegates will have on the final result. If Sanders can't win over swaths of minority voters and Clinton succeeds in dominating many of the primary contests, she can establish a delegate lead that will be nearly impossible for Sanders to overcome. But if Sanders holds even with Clinton as the primaries continue, it could be a different story. "These folks have a vested interest in this process, it's in their interest not to go against the will of the people," Putnam said of superdelegates. "If it's close then we're much more likely to see the remaining 300 folks who have not endorsed a candidate...split their votes across the two candidates." How did the superdelegate system come about? After the 1968 election, the Democrats began using the system of primaries and caucuses to choose pledged delegates to the national convention. But in 1972 and 1976, the party ended up with lesser-known nominees who didn't perform as well on the national stage (former Sen. George McGovern, who lost the election to former President Nixon, and former President Jimmy Carter, who was only elected for one term). Elders in the Democratic Party saw "a need for there to be a voice for the establishment within the party to not necessarily overturn the will of the voters, but to nudge along a nominee who would be well equipped to win during the general election -- to avoid nominees like George McGovern and Jimmy Carter," Putnam said. Things came to a head during the 1980 presidential campaign, when Sen. Ted Kennedy challenged Carter for the nomination, a fight that went all the way to the floor of the convention. In 1982, a group of party leaders created the Hunt Commission to reform the nomination process. Thus, the superdelegate system was born. In a 2008 op-ed in the New York Times, Geraldine Ferraro, who sat on the Hunt Commission before becoming her party's vice presidential nominee in 1984, wrote, "Democrats had to figure out a way to unify our party. What better way, we reasoned, than to get elected officials involved in writing the platform, sitting on the credentials committee and helping to write the rules that the party would play by?" Plus, it keeps some power in the hands of the party leaders - a fact DNC Chairwoman Debbie Wasserman Schultz affirmed on CNN earlier this month. "Unpledged delegates exist really to make sure that party leaders and elected officials don't have to be in a position where they are running against grassroots activists," she said. Have they determined an election before? No. They came close, during the 1984 nominating process, when it looked like Mondale might need the superdelegates to help him hold off former Sen. Gary Hart. But Mondale ultimately won a plurality of the proportionally-awarded delegates, making his superdelegates unnecessary. Superdelegates also played a bigger role in the 2008 campaign. Although Clinton built up an early lead among superdelegates, many switched their support to then-Sen. Barack Obama as he began performing better and better in the election. While some people argued that superdelegates should not play a role with the popular vote so close, Ferraro argued the opposite in her op-ed. "Superdelegates were created to lead, not to follow. They were, and are, expected to determine what is best for our party and best for the country," she wrote. No. Each state has a certain number of delegates based on its size, as well as three delegates from the Republican National Committee (RNC), the chair of the state party, and the national committeeman and committeewoman. 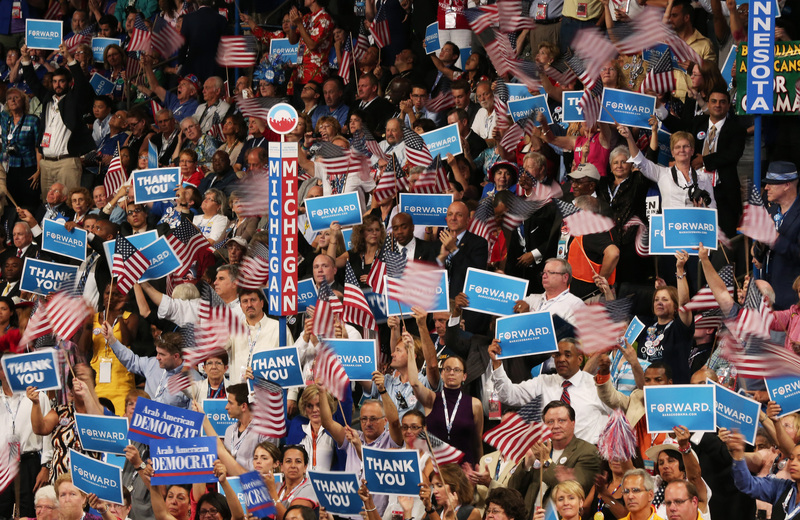 In the past these delegates could be unpledged, like the Democrats' superdelegates, but the RNC changed the rules in 2012 so they would be bound to reflect the will of voters in their states. CBS News' Jennifer De Pinto contributed to this story.